A rule for noise reduction can be based on the effectivness of the silencer. 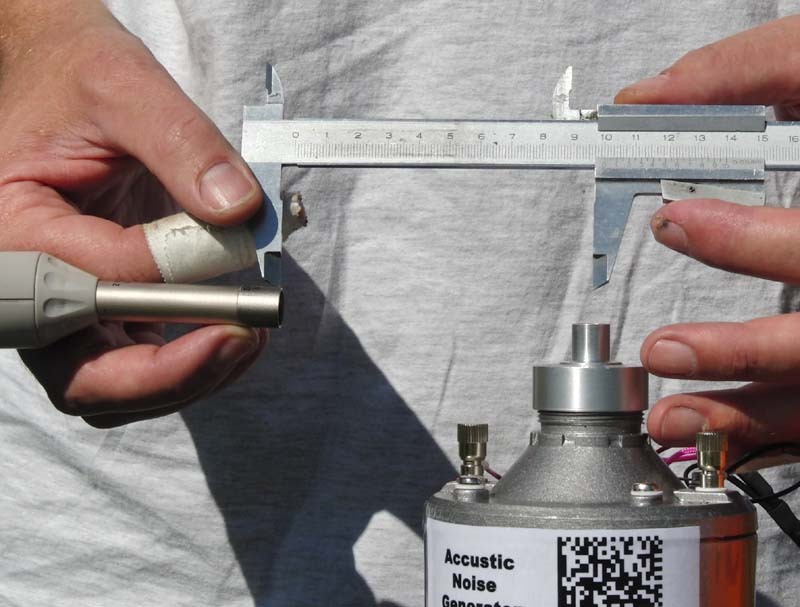 Silencers must demonstrate certain effectiveness when tested on an acoustic noise generator. The actual level of effectiveness can not be set before more experiments and test have been made. At the moment the best guess would be a effectiveness of at least 12 dB(A). Update 12/11: The Russian proposals suggest 20 dB. After some experiments with high effective silencers I find this value OK. The effectiveness measured with the noise generator is not the same as the effect the silencer will have on the noise from an engine. The noise generator is using Pink Noise but an engine will have some dominant frequencies. A silencer will not have the same effectiveness at all frequencies. When the silencer is working on the hot exhaust gas (approximately 400 °C) the noise reduction will also be 2-3 dB less. These variations between the test situation and the real life will give some difference between the effectiveness measured and the noise level with a running engine. The intension with the noise generator is not to tell exactly how much a silencer will reduce the noise. 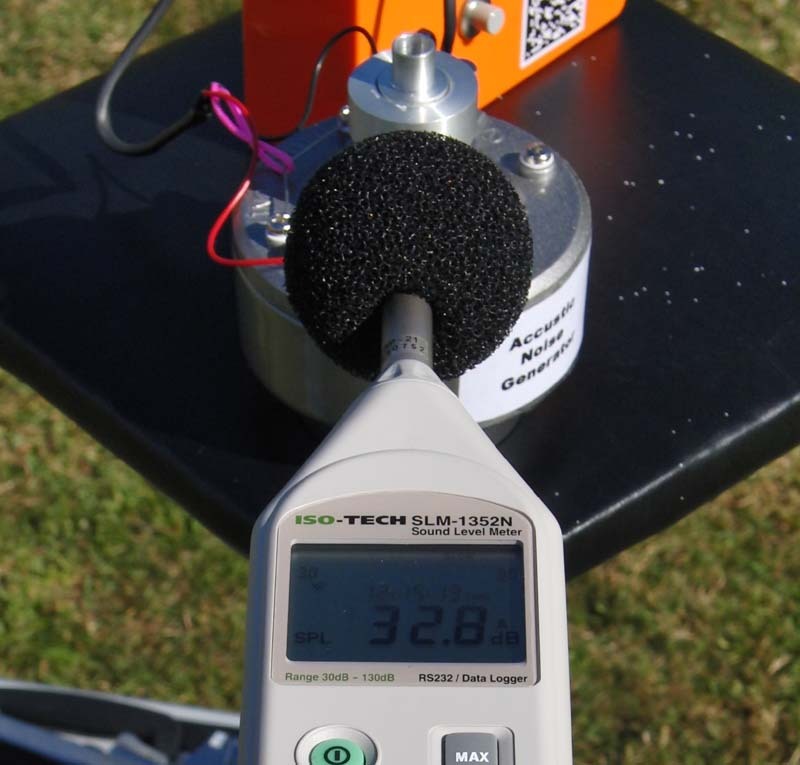 It is a simple way to test if a silencer has a certain minimum effect on noise in a test situation that is easy to reproduce. If a silencer can demonstrate a high effectiveness on Pink Noise it will also have god effect on the noise from a running engine. The effectiveness of a silencer can be found with the acoustic noise generator and a sound level meter. It will take two measurements to find the effectiveness of a silencer. First the noise level is measured for the noise generator without the silencer. For this test the noise generator must be fit with the adapter that suits the silencer. Next the noise level is measured for the noise generator with the silencer. The difference between the two measurements is the effectiveness for the silencer. This test can be made in a few minutes. If more silencers of the same size are to be tested the test can be done even faster. The result is quite precise and can be reproduced with a good accuracy. The noise levels are measured with a Class-2 sound level meter at a distance of 100 mm from the center of the outlet and perpendicular (within +/- 5 degrees) to the axis. The result for the effectiveness of the silencer is basically independent of the measurement distance but the two measurements must be made at the same distance within 5%. If the measure distance is set to 100 mm the tolerance will be +/- 2.5 mm. With a 100 mm measurement distance reflecting object at 1 m will have no effect on the results. Measurements can be done on a table in a room (minimum room volume 30 m3). For easier alignment the noise meter can be mounted on a tripod. The background noise must be at least 10 dB lower than the lowest noise level measured in the test. With the high sound level (around 90 dB) in the tests this will not be a problem. Engines can even be run close to the test site without disturbing the result. Henning Forbech checking the distance before the test. Monica Frandsen is helping. Measuring the background noise before the test.